Craft soda is one of the hottest new trends, and we are here to facilitate your growth in the market! Many customers are looking for a nostalgic experience with real sugar and natural flavors. Other customers are looking for something unique or “gourmet”. 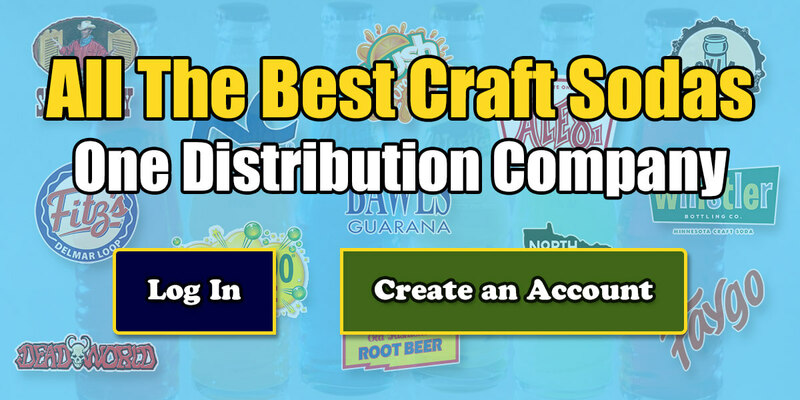 By choosing us as your craft soda distributor, we bring you all the brands and flavors that your customers desire; plus many varieties that we distribute exclusively! Blue Sun Distribution is proud to offer our craft soda varieties for distribution in the Twin Cities area of Minnesota, and beyond! We offer free warehouse pickup and local delivery within 30 miles of our warehouse, and we ship to the upper Midwest region. Each business is different, so please contact us to discuss your order options. Here’s an overview of what we offer and what you can expect when purchasing from us. We offer the largest variety of craft sodas in the region, hands down. In fact, our retail store, Blue Sun Soda Shop, has the largest selection of craft sodas in the world with over 1300 flavors for customers to enjoy. This means you can order all of the most popular brands and flavors from one convenient place! Best of all, our online ordering process is simple and to the point. In addition to our huge selection of popular nationally-known brands, we also offer many varieties that our exclusive to our company. For example, Whistler Soda and North Star Soda are sought-after brands which are owned and distributed exclusively by the Blue Sun Distribution Warehouse. With our ever-expanding line of brands, we are the fastest growing craft soda distributor in the country. Whether you are a bar seeking high-end ginger ale or mixers for cocktails or retail store looking for a wide variety of flavors to offer your customers, we distribute all the most recognized and popular brands. We have more types of root beer than you can imagine, and we offer unique flavors you won’t see anywhere else. With our easy online ordering system, replenishing your inventory is a snap. Simply login, add the desired cases to your order, and complete the checkout. It’s that simple. Additionally, we have a friendly and helpful staff on hand to assist you in ordering and determining which options are right for you. © Copyright Blue Sun Distribution - Craft Soda Distributor in MN. All Rights Reserved. | Trademarks and Brands are the Property of their Respective Owners.